I used this balaclava on multiple cold weather hikes in Southeastern Pennsylvania, where temperatures hovered around 25-30 degrees Fahrenheit. I paired the product with a Patagonia down jacket each time I wore it. Warmth: When looking for any sort of balaclava, the obvious goal is to stay warm and protected from the elements. The Montbell Down Balaclava goes above and beyond checking this box—you can feel the warmth from the down insulation almost as soon as you put it on your head, and the adjustable hood (we will dive into more details below) does a fantastic job at sealing the cold air out. The hood comes up to around your mouth, which means that your whole head is protected from the elements. Even with freezing temps and chilly winds, this thing managed to keep my head warm and toasty all day long. Three-way adjustable hood: After playing around with the adjustable hood, it feels as though this balaclava was made specifically for the dimensions of your head. With adjustment cords in the front and back, as well as a hood adjustment toward the top, you are able to size the product to maximize thermal performance, and streamline it enough to still use your peripheral vision. 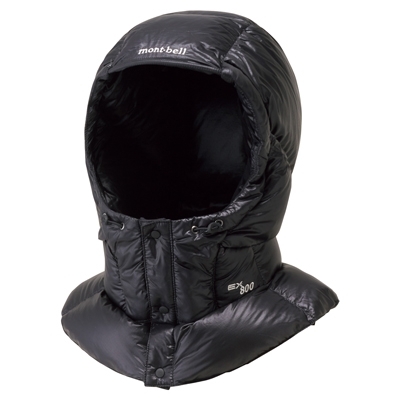 The adjustable hood also solves issues for backpackers who use quilts throughout the winter. It allows the balaclava to easily stay snug on your head, even if you move while sleeping, and keeps you warm all night long. Packed size/weight: Thanks to Montbell’s 800-fill down, the balaclava packs up to an incredibly small size, and weighs only a few ounces. 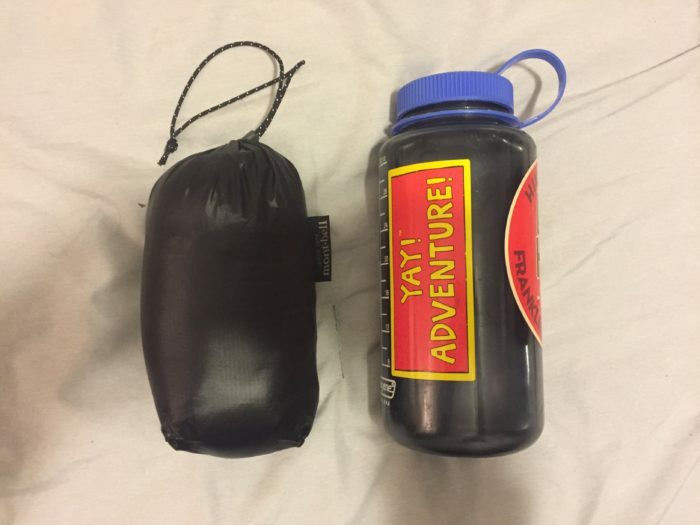 This makes it perfect to throw into a pack for both day hikes and winter backpacking trips. Packed up, the product stands just under seven inches tall and weighs 3.1 ounces, which is smaller and lighter than many down balaclavas on the market. It packs up so small, that even if you are heading out without a backpack, it’s easy enough to throw in your pocket just in case it gets chilly later in the day. Noisy: The only issue I found with the balaclava is that the nylon makes a pretty loud “swish” sound when moving your head. Although hiking partners don’t seem to notice the sound too much, they will notice when you stop answering them because you can’t hear through the swishing. I was able to prevent this slightly by allowing the balaclava to sit a little bit looser on my head, but with extreme temperatures and wind this may not always be an option. The Montbell Down Balaclava is perfect for minimalists who have a need for on-trail flexibility. The product allows you to add a hood to your favorite winter jacket, or gives quilt users the ability to stay warm on cold weather trips. The three-way adjustable hood is truly customizable, and paired with the 800-fill down insulation, ensures your head will stay warm and toasty in all sorts of weather situations. Although the nylon can get noisy while brushing against your ears, this is overshadowed by the extremely light weight and small packed size. For a maximum amount of warmth, small size, and reasonable price tag, the Montbell Down Balaclava is a solid choice for minimalists who want to keep hiking all year long.